What I’ve Learned from 35 Svengoolie Appearances! 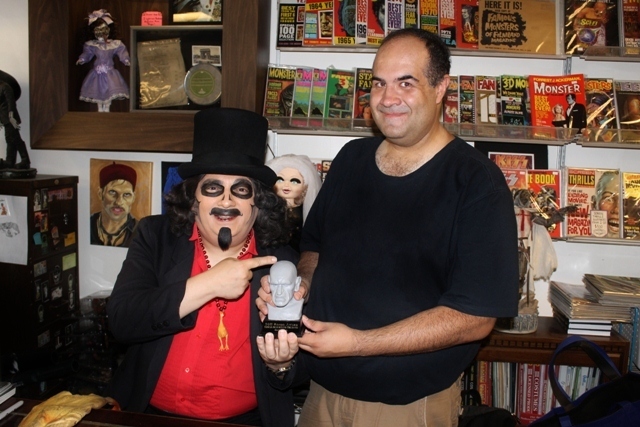 Last weekend I went to see national horror host, Svengoolie, at a Chicago store called Cook Brothers (“We stack em Deep and Sell em Cheap!”). Though not as remarkable as his previous appearance at The Squared Circle, it did represent a bit of a milestone for me. 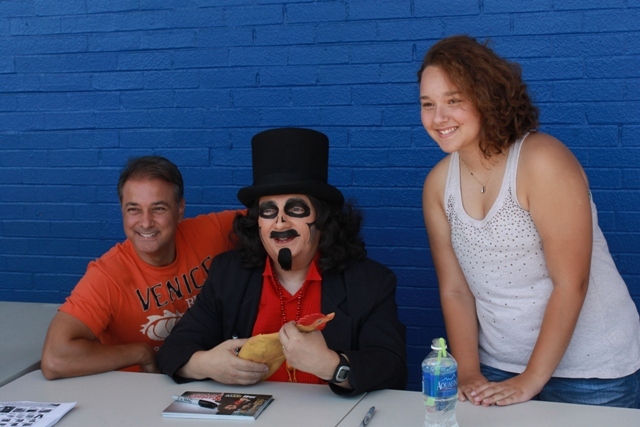 Since discovering that he’d return to the airwaves in 2003, this would mark my 35th time seeing him (either as Svengoolie or Rich Koz) at a public event. 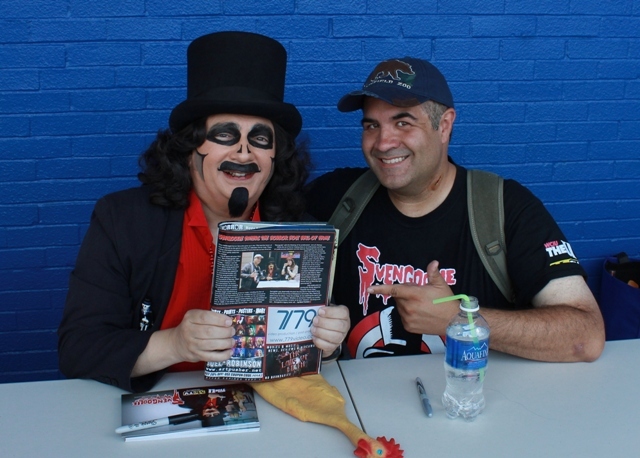 Growing up in Chicago back in the ’70s, I’d watched and idolized him during his Son of Svengoolie days – though never had the honor of meeting him until after I’d rediscover him (simply as “Svengoolie“) as an adult. Sadly, this revelation didn’t come until after he’d been back on commercial TV for seven years, though you can’t say I haven’t make up for lost time. This past decade would see many changes in my life; the most positive of which would be directly linked to my Svengoolie fandom. Via the Svengoolie YAHOO forum, I’d meet a fellow fan (also named Dave) living in Rhode Island and our friendship would soon lead to the creation of this site. After becoming a “Terror Dave,” I’d then share my Sven-thusiasm via this blog, my YouTube Channel, Scary Monsters Magazine and in the latest issue of Horrorhound Magazine (which I’m holding at the top of this piece). 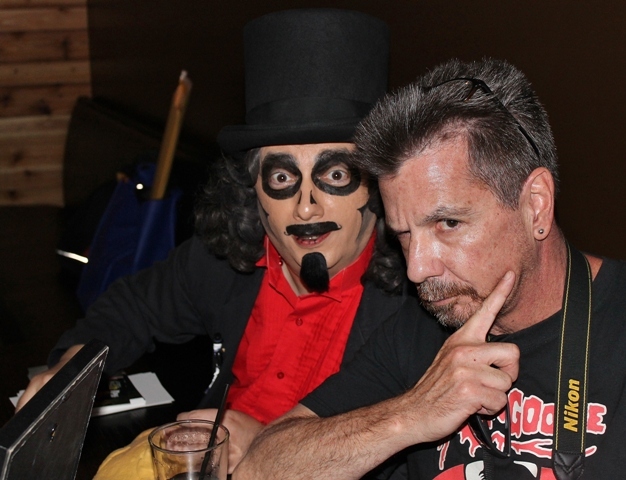 Despite my increased visibility as a Svengoolie fan, let me state that it does not make me any more remarkable than any of his legion of other admirers who express their fervor utilizing their own talents (often more impressive than mine). And, even if you don’t feel you have any special gifts or platform to offer, watching him faithfully every Saturday night will certainly suffice. In celebration of my devotion (or obsession, depending on how you want to look at it), I decided to do something a bit differently than my usual appearance overview. 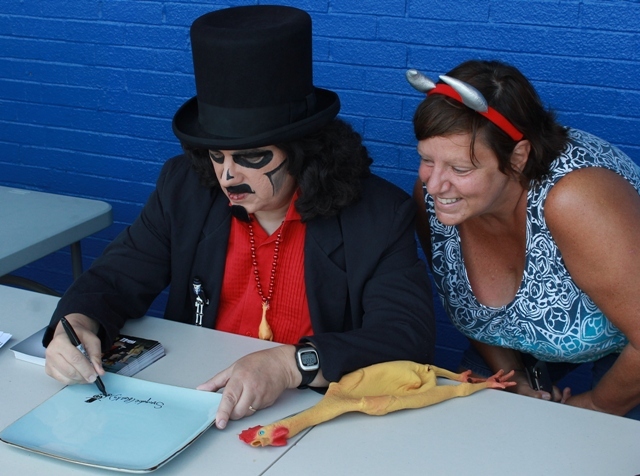 Instead I thought I’d use my rather unique perspective to share 15 lessons I’ve learned from 10 years of Svengoolie appearances. #1) Svengoolie doesn’t Bite! Yes, I know he’s a vampire but, in this case, I’m addressing the trepidation many fans have regarding their first Svengoolie encounter. At almost every single Sven event I’ve attended, the majority of visitors are meeting him for the first time and worry whether or not he’s friendly. I discussed it last year when covering his appearance at The Rockin’ Ribfest (seen HERE). In that post I also talked about how I, too, was once there myself. 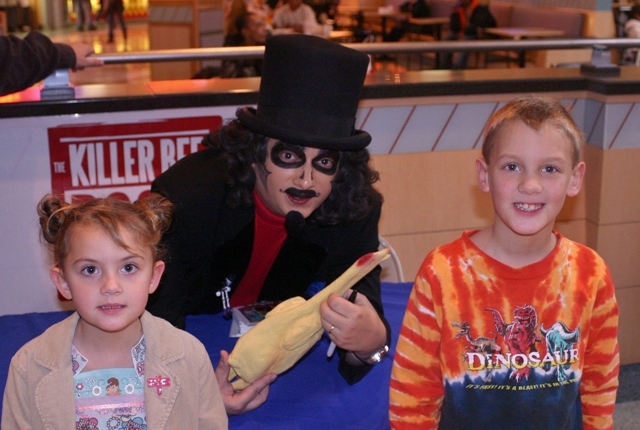 The first time I met Svengoolie was ten years ago at The Ford City Mall and he was sitting by himself (the first and last time I’d ever see that occur) for a WCIU event. He looked up at me and I totally froze – cowardly sending my kids to meet him instead. Ten feet away (which I deemed a reasonable and safe distance) I hovered with a dorky grin on my face while offering a nervous wave. Later I’d discover what everyone else who meets him does, he’s a genuinely great guy. 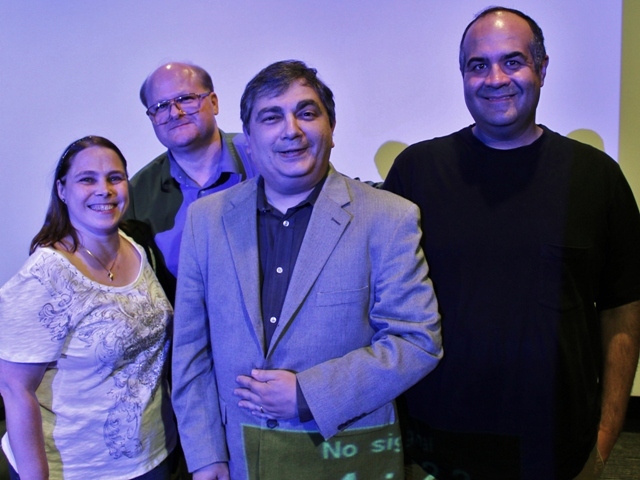 It’s always a slippery slope when meeting your idol…thank Heavens mine was Rich Koz! First meeting with Sven I stayed safely behind the camera! #2) Svengoolie has a sidekick. While Tombstone, Kerwyn, and Doug Graves may share TV time with Sven, there’s but ONE who stands out during his public appearances. Jim Roche not only assists Svengoolie during the majority of these occasions but totally enhances them! He’s as quick-witted as the host and, with the two volleying comments back n’ forth, like witnessing an unscripted show. Jim has the uncanny ability to keep track of everything going on in the signing area, cutting immense fan lines (when necessary) with pin-point accuracy to match the signing schedule, while also interacting with both Svengoolie and his fans simultaneously. He accomplishes all of this while never breaking the most fundamental sidekick rule..compliment your horror host but NEVER upstage them. #3) The early bird catches the rubber chicken! No matter where Svengoolie is signing, it’s always a good rule of thumb to get there early. This was a lesson I’d learn the hard way. In 2008 I drove down to Bourbonnais, Illinois (the farthest south I’d ever seen him) at a County Fair. It was pouring rain and I stood huddled with the kids, our feet covered in mud, for 90 minutes. The next year I found myself at the wrong end of a two hour line at The Party City store in Orland Park. But NO event, however, would compare to the infamous J.J. Blinkers appearance of 2011 (covered HERE). The small trick shop was located about as far north as that aforementioned county fair was south in Antioch, Illinois by the Wisconsin border. To further entice visitors, they offered free Svengoolie gift bags for the kids and custom Svengoolie Rice Krispy Treats. This, coupled with an army of Wisconsin fans thrilled to see him so close to home, would create the perfect storm and a line that ran over a city block. Though staying way past his allotted time, not all were able to meet Sven that day so, again, arrive early! #4) Always bet on Svengoolie’s horse! I’m not a gambling man by nature. I don’t buy lottery tickets and have only made it to a casino once in my lifetime (I won $150 the first 5 minutes then stopped and watched my friends go broke for the next two hours). 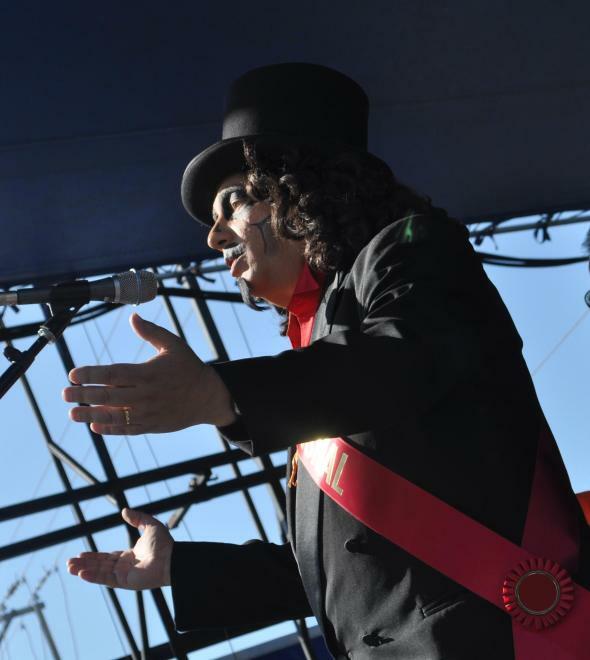 But after seeing Svengoolie at The Hawthorne Racetrack in 2012 (covered HERE), I’d regret not being more of a risk taker. After signing for fans, Sven was given the task of choosing his winning picks for three separate races. He chose them based on their names and what they reminded him of. For example, he chose one based on a name that reminded him of his band days back in high school. Each time I considered betting on Sven’s horses (if for no other reason than to make for interesting coverage) and decide against it…and EVERY one of his three picks won! #6) Be prepared to handle the Chicago weather! 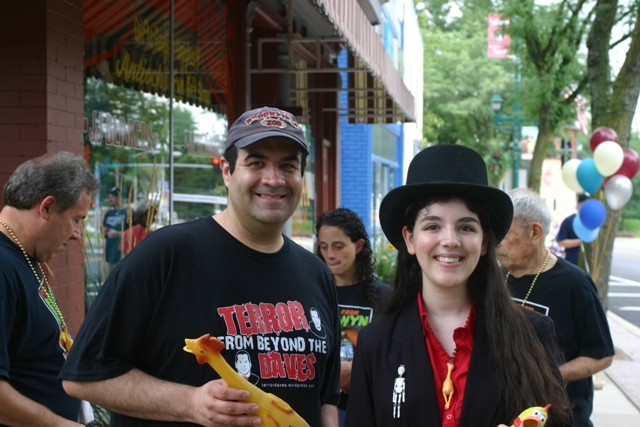 The Nightmare on Chicago Street appearance last October (covered HERE) was freezing cold but, more often than not, it’s the summer heat and humidity that’s an issue with Svengoolie being one horror host that doesn’t just appear around Halloween. Last July, during a Joliet Slammers Game (covered HERE), the scoreboard showed a temperature of 105 degrees and Sven, for the first time, arrived wearing one his own T-Shirts. The worst for me, however, was the last time he appeared at Horrorbles in Berwyn. We waited outside for over an hour and, while the temperature wasn’t bad, the humidity was a nightmare. I’d brought along my Rondo Award hoping for a nice photo op but, with my shirt drenched in sweat and my hair kinking up, the picture looked like I’d just forged the statue in an active volcano. Note to self: bring towels to wipe perspiration and wear a baseball cap! 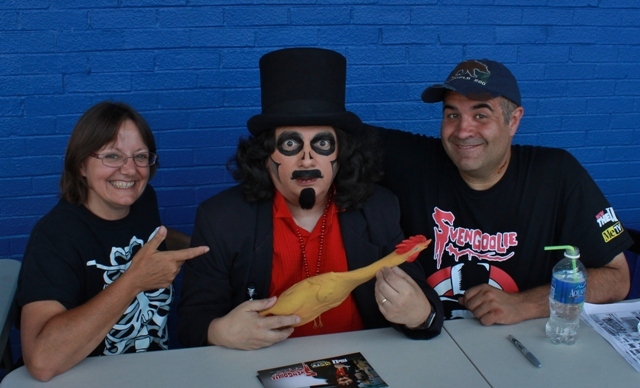 #8) Being a Svengoolie fan means you’re in good company. The Sven geeks have truly inherited the Earth as proven by some of the amazing celebrities that count themselves as fellow Svengoolie fans. Robert Englund, Mark Hamill, and Julie Adams are awesome enough, but a beauty like professional female wrestler, Miss Varon, makes it even cooler (or should I say hotter?)! #9) Berwyn loves him! Okay, folks, let me make it clear that Svengoolie does not, nor ever has, resided in the Chicago suburb of Berwyn (and, no, he’s never worked there either). It’s probably the biggest Svengoolie myth that’s out there. The tradition of poking fun of the town was started by the original Svengoolie, Jerry G. Bishop, and was based on the antics of Ohio’s Ghoulardi who’d made his digs at a town named Parma. I have no idea what the good people of Parma, Ohio are like but Berwyn’s residents are not afraid to laugh at themselves and think Svengoolie is tops. This was always proven whenever he’d visit the world’s only horror shop – Horrorbles but even more so during the town’s Houby Parade. For those less savvy, its a Berwyn celebration of mushrooms…and one of the many reasons Bishop chose this town as his Parma. 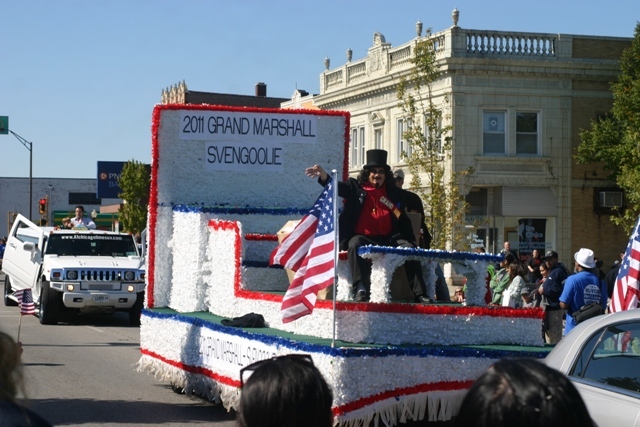 In 2011, Svengoolie would serve as the parade’s Grand Marshall, sending the locals into rounds of applause as he threw rubber chickens at them (my daughter was thrilled to have caught one herself). Later, those same chickens would find themselves embroiled (or perhaps broasted would be a better word) in a political scandal referred to as Chicken-gate (seriously). Apparently those chickens had been purchased from a store owned by a town board member which was a big no-no (though when one thinks about Chicago politics in general, its amazing this even registered a “blip”). 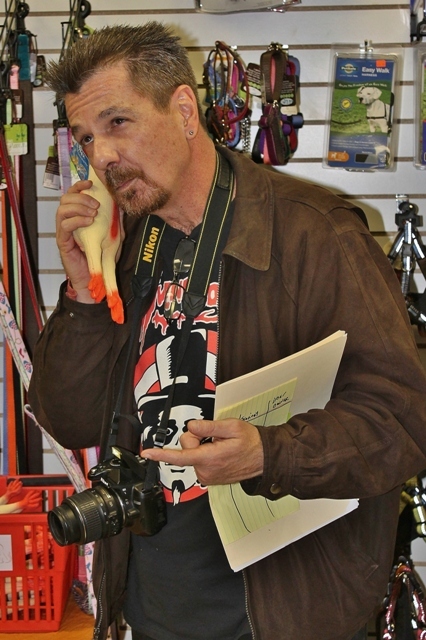 Officials cried “fowl” even though the move ended up saving the town lots of money as the store sold them dirt cheap. Regardless of the fall-out, Sven’s appearance was a huge hit with the citizens, and a day I’ll never forget! #11) He’s no longer exclusive to Chicago! 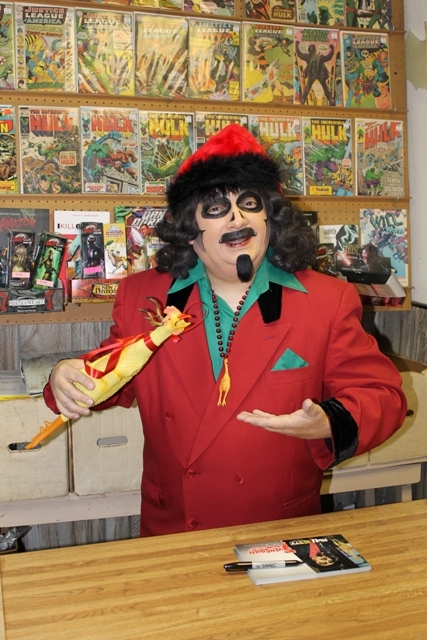 In March of 2011 Svengoolie would go from a “Chicago” TV Horror Host to a “National” one when the local station MeTV began airing throughout the country. He’s now seen in over 90% of the US as well as parts of Mexico and Canada. I can’t recall any other host save Elvira who has reached this level of recognition in America and of no horror host who’s been able to maintain this status for over two years (and counting). During his appearance at G-FEST last year it became evident that his fan base was growing with new out-of-state fans there to see him. It was also witnessed just this past weekend at Cook Brothers when fans from Arizona stopped by to see him! Mike and Mattie from Arizona! #12) Svengoolie is as a big a geek as we are! Surprisingly, not all professional horror hosts walked the walk and actually enjoyed the material they were airing. For them it was a job while, in the case of Svengoolie, he really is one of us. Whether you’re talking horror, sci-fi, comic books, or wrestling Sven is a fan too! This was evident during his Christmas visit to the Comic Collector shop where the host donned a more seasonal outfit and became Sventa Claus! He’s pals with one of the industries most celebrated artists, Alex Ross, and absolutely knows his super heroes in both the DC and Marvel Universe! Avengers assemble…and watch Svengoolie! 13) Never be afraid to dress up like the host! It’s an odd phenomena in the horror host world but, for some reason, I see mostly men dressing up like Elvira and women dressing up as Svengoolie. One of the most notable was Jamie Lee Cortese though there’s been others such as Sven-Girlie and Sven-Julie. Regardless, there’s nothing wrong with donning the hosts garb at events no matter what your gender or whether its Halloween or not. Jamie is now an intern at the station and, as her role at Svengoolie appearances is now more official, she’s seen wearing a Svengoolie shirt as opposed to being a fem-goolie. Personally I think the station should make his assistants dress as watered down versions of the host – like a villain’s henchmen on the old Batman shows…but somehow I don’t think Jim would go for that. #14) He’ll sign anything! I’ve seen the host handed DVD’s that have nothing to do with him, boxes of Count Chocula cereal, and last weekend…a plate! It was great seeing an old friend from a 2011 appearance named Donna Sweeney who, not having anything to sign back then (at Ultra Foods covered HERE), grabbed a can of corn from the aisle she was waiting in and had him sign that! 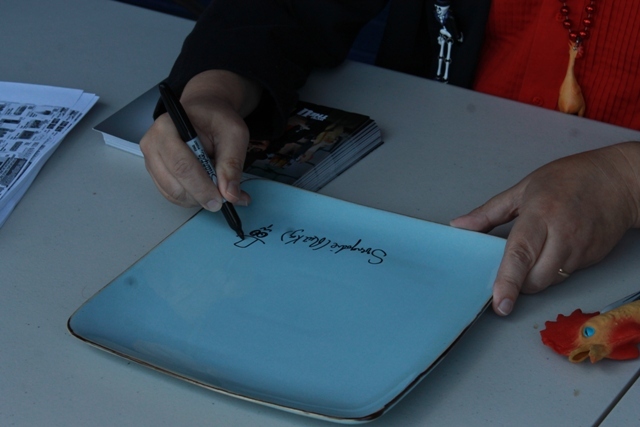 Apparently, finding creative objects for Svengoolie’s signature is hereditary as her sister, Laura, showed up this time around and had him sign an ordinary plate! I should probably mention that only does Sven sign for free, he also offers free promo cards to sign so ransacking the kitchen cabinet is not necessary. Laura watches Sven turn an ordinary plate into a Horror Host Work of Art! Of course I probably should make an addendum to this as there are some things he won’t (or shouldn’t) sign. Take last year’s visit to The Volo Auto Museum (covered HERE). There was an over enthusiastic gal who really wanted the host to sign her breasts (?). Whether this was not an option by Sven’s and Volo’s family values or the fact that she wore a turtle neck is unknown. What is known is that she asked him to write his phone number on her hand instead. Sven did write a number but, with 588-2300 (a well-known Chicago carpet store), he won’t be going anywhere near her rug any time soon. (okay, go ahead and throw a rubber chicken at me, I deserve it). This entry was posted in Horror Hosts, Stalking Svengoolie! and tagged COMIC COLLECTOR, Cook Brothers, DePaul University, Doug Graves, Elvira: Mistress of the Dark, Ford City Mall, G-Fest, GHOULARDI, Hawthorne Race Track, Horrorhound Magazine, Houby Parade, Into the Half-wit's Studio, J.J. Blinkers, Jerry G. Bishop, JIM ROCHE, Kerwyn, MeTV, Party City, Rich Koz, Rockin Ribfest, Rubber Chickens, SCARY MONSTERS MAGAZINE, Son of Svengoolie, Svengirlie, Svengoolie, SvenJulie, Tombstone, Ultra Foods, vampire. Bookmark the permalink. ← 2013 “Days of Dead” Indianapolis: Creative Dealers and their Ghastly Goods!